It may be a trunk, but its performance is as full of fertile surprises as Mikhail Baryshnikov dancing. Fiasco Theater, Folger Theatre, Washington, D.C.
Iachimo (Ben Steinfeld) praises the beauty of Imogen (Jessie Austrian) as she sleeps on her bed (the trunk) in the Fiasco Theater production of William Shakespeare's Cymbeline now playing at the Folger Theatre. The trunk also is playing Iachimo's trunk in this pivotal scene. Photo by Ari Mintz, Fiasco Theater. After seeing Fiasco Theater's production of William Shakespeare's Cymbeline at the Folger Theatre, I walked out of the theater with a buoyancy in my step, a fast-beating heart, and a great sense of contentment. It's the same as I feel after an Elton John concert (with the Two Cellos) and after this past romantic weekend getaway with my wife. You know what you are getting and yet you end up getting so much more than you could have anticipated. Thus with Fiasco's Cymbeline: It's not just that we saw Shakespeare done so well and with such great theatrical fun, it's that I had such high expectations going in, and Fiasco flew past those expectations even before the interval, and the surprises kept coming. This six-person Fiasco Theater production opened Off-Off-Broadway in 2011 and was picked up by Theatre for a New Audience, which staged it at the New Victory Theater. It ultimately ran for almost 200 performances through 2012, turning Fiasco into the critical darlings of the New York theater scene. The company mounted Shakespeare's Measure for Measure at the New Victory Theater this winter, and then The Folger produced Fiasco's version of Shakespeare's Two Gentlemen of Verona this spring. As an add-on to The Folger subscription season, Fiasco is reviving Cymbeline. We had seen Measure and Two Gents, and I interviewed the company's three founders and co-artistic directors for Shakespeareances.com, but this was our first opportunity to see the play that launched the company's rapid rise to theater superstardom. Many people who had seen Fiasco's Cymbeline described it as "awesome," a word I consider overused and, consequently, under-purposed. Well, it is "awesome," but let me put the term in a concrete context: Cymbeline's run at The Folger is a short one and most tickets are surely sold, but if you live within 12,500 miles of Washington, D.C., you should make every effort to see it. That is my definition of awesome. Fiasco's players do so many things right when they stage a play, but a fundamental element is the obvious acknowledgment that they are performing a play rather than trying to present a virtualized reality. Wearing costumes of a timeless fairy tale quality designed by Whitney Locher, the actors speak and act out Shakespeare's language so deftly as to put our imaginations in one state of reality while their method of presentation keeps our intelligence grounded in the reality of the theater. As Cymbeline contains 35 speaking roles and the final scene requires nine speaking characters on stage even in this production, all but two of the six actors triple parts (some roles are excised and others combined). Not only do they make no apologies for this fact via some slight of hand or technical effect, the actors attack the logistical challenge with winking fervor, especially in that multipart finale. Before the play starts, the actors hang out on the stage, talking among themselves or with members of the audience while warming up or positioning their instruments and props. Then, during the play, when not performing on the oval polished wood stage, the actors sit in chairs lined against the wall around the back, providing the ubiquitous messenger lines, musical support, and sound effects (billiard balls knocking against each other in the Roman scenes are especially clever). In these moments the actors either are not in character or are in character as actors watching their fellows, which they do with rapt attention, laughing at improvisational moments and glowing in appreciation of the musical performances. Frankly, even if you were to see their play 200 times, too, the music in particular can trigger states of raptured expression—no feigning necessary—from the a cappella Renaissance choral music to the washboard-rhythm, banjo-picking Appalachian folk song in three-part harmony. It's a multilayered theatrical cake that we can have and eat, too. We are watching a play, we are watching actors staging that play, we are watching people becoming actors to stage that play, and, in that last relationship, we become a part of staging the play through our own imaginations. That charge is given us in the opening lines when Ben Steinfeld turns the background-setting gossip between the two Gentlemen into a prologue. He slightly alters some of the lines for the purpose. The First Gentleman tells of Cymbeline's two stolen princes, his princess's elopement with a commoner orphan, an evil stepmother, and her lout of a son: "Howsoe'er 'tis strange … yet is it true." The Second Gentleman's reply, "I do well believe you," Steinfeld directs to the audience as "You must now believe it." He slyly has transferred the Second Gentleman's part to us, and we do well believe. Fittingly, for its second curtain call, the company applauds the audience, acknowledging our active role in successfully staging their play. I say six actors but, really, there are seven performers. There's the trunk, too. Along with two small crates that serve as seats, containers for props, and the boulder-strewn hills of Wales, the trunk, designed by Jacques Roy, is the set. It seems a nice-looking yet simple blond-wood trunk, but it has magical properties we Muggles can only marvel at. It plays the roles of a ship, a pool table, a tavern table, a throne, two beds, a toilet, a cave, and, of course, a trunk, the one Iachimo uses to sneak into Imogen's bed chamber (one of Cymbeline's great gotcha moments for people unfamiliar with the play is Iachimo emerging from the trunk; in this production, we know he's in the trunk, but as the trunk is also doubling as Imogen's bed, his emergence still is a good gotcha even for us familiar with the play). The trunk becomes the means by which Guiderius presents Cloten's decapitated head and then becomes the means by which Cloten becomes the headless trunk that Imogen mourns over. In the battle scene, the trunk plays a barricade taking direct hits from enemy archers. It may be a trunk, but its performance is as full of fertile surprises as Mikhail Baryshnikov dancing. Purists may cringe at the company's textual manipulations, but, in fact, even the gimmicks are thoroughly Shakespearean; the trunk, for example, is an image Shakespeare uses in this play beyond serving as the vehicle for Iachimo's duplicity. Fiasco has made major cuts to Shakespeare's script, most significantly all of Act Five, Scene Three, in which the ghosts and Jupiter visit a sleeping Posthumus in prison. This deprives the play of its supernatural thematic strand, for good or bad, but it also allows for an energy-driven pace to the play's great plot-strands-twining climax (to me, the greater loss in cutting the vision scene is not missing the allegorical arc but a missed chance to see the Fiasco cast play out Posthumus's dream: I bet the trunk would have made a great Jupiter's eagle). Other than this scene, most other cuts and character consolidations are hardly noticeable, and the key plot elements remain intact while the play's central theme—the duality and tension between outward appearances and inner reality—is heightened. Another noteworthy alteration is Belarius reconfigured as Belaria, a woman. That's no big deal in the storytelling but is a good deal in the playing as it allows Emily Young to shine in yet another singular character when she takes on the role of surrogate mother to the lost princes. For all the laudatory ink that has been expended on the trunk and style of this production, its underlying foundation is the talent and intelligence of this troupe; and by intelligence I specifically mean Shakespearean intelligence. Though Steinfeld and Noah Brody are co-directors, the whole ensemble studies and studies and studies the plays they stage, and everything they do, down to how they thematically double and triple parts, grows out of the verse itself. It may not be pure, but it's true, and in fact truer than some productions using seven times the number of actors. This Shakespearean fealty also factors into individual portrayals. Jessie Austrian turns Imogen into a glorious mix of spunky princess and romantic teen transitioning into an adult world where she learns cynicism and survival in equal measures. Opposite her, Brody embraces the dilemma that is Posthumus; how can such a person of noble reputation and bearing be such a hothead on his way to Rome (by report), so easily fall prey to Iachimo's scam, become so wracked with jealousy he orders the murder of Imogen, and upon receiving word his order has been carried out turns his guilt into a depression-ridden death wish? Because nobility, by its nature, is a patchwork of all these qualities. Paul L. Coffey handles Posthumus' Roman host Philario, the Roman general Caius Lucius, and lost prince Guiderius, but it is his Pisanio that is indelibly done. Merging the part of Posthumus's and Imogen's servant with the original script's Second Lord who makes snide comments behind Cloten's back, Lucius gives an understated performance that displays Pisanio's dedication to duty in the most precarious of situations while his quiet reserve proves him the wisest character in the play. Andy Grotelueschen does triple duty. He is the play's titular king, ever bearing in his heart the anger of having his sons kidnapped 20 years ago, a hurt now magnified by his sole daughter eloping with Posthumus, whom he immediately banishes. He is the doctor Cornelius, wearing goggles and self-impressed with his intellectual stature. And he is Cloten, Cymbeline's stepson and ill-suited suitor to stepsister Imogen. Cloten is a clown part, and Grotelueschen with his wild hair, expressive face, and loud manner could easily have taken him over the top, but he puts just enough restraint on his performance to give us a Cloten whose arrogance oozes rather than explodes forth. A measure of the portrayal's success is this comment a young man new to the play said to me during intermission: "I hope he gets the girl; I know he probably won't, but still." That's perhaps a product of the Seth Rogen culture we are currently witnessing, but it also is a testament to Groteleuschen's ability to portray the jerk with enough likability that he meets Shakespeare's demand to get us to both laugh at and mourn his sudden demise. 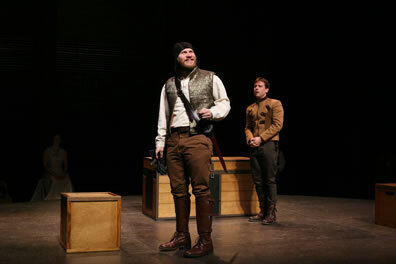 Cloten (Andy Grotelueschen, left), takes on Posthumus's clothes before setting out after the fleeing Imogen as Pisanio (Paul L. Coffey) watches in the Fiasco Theater production of William Shakespeare's Cymbeline, playing at the Folger Theater. Photo by Ari Mintz, Fiasco Theater. Great Shakespearean performances all, but for breadth of acting skill, I must single out Young and Steinfeld. Combined with her completely individualized portrayals of Isabelle and Mistress Overdone in Measure for Measure, and Lucetta and Sylvia in The Two Gentlemen of Verona, Young establishes herself in Cymbeline as one of the most skilled actresses I've encountered in my long experience as an audience. Her Queen is seductive evil, scheming sweetness, and powerful political manipulation, the last thanks in part to her taking on some of Cymbeline's lines in the embassy scene with Lucius (Grotelueschen is playing Cloten in this scene, so the king is absent). She switches from a long, form-fitting, double-slit royal gown to a veritable burlap sack to play Belaria as a hillbilly matriarch with a Loretta Lynn edge in her voice. Even in the bit part of the Frenchman in the Roman scene, Young is entirely that character. Over the seven roles I've seen her play in the past three months, she accomplishes something along the lines of Alec Guinness in Kind Hearts and Coronets. After wowing us as Lucio in Measure for Measure (he was not in Two Gents), Steinfeld does so again as Iachimo (he also plays a Bryce Harper of an Arviragus). The key to his Iachimo, who would make a great contestant on Big Brother, is that Steinfeld builds it backwards. In the final scene, Iachimo gives a long-winded, self-centered accounting of his detestable deeds with such showy flourishes that twice Cymbeline insists he speed up the telling. "I stand on fire. Come to the matter," the king yells. "All too soon I shall," Steinfeld's Iachimo answers peevishly. It's a clearly comic characterization in a scene that otherwise could slip into melodrama, and as such it clues us into the real nature of the character. Iachimo shades less toward Iago and more towards Parolles on the spectrum of Shakespeare villains, but with a bit of Aaron opportunism to make him dangerous enough. In Steinfeld's reading, Iachimo ensnares Posthumus as a lark just to prove himself the smarter, worldlier man. Plus, he's certain he can win any woman, easy. Realizing he can't win Imogen and his wager with Posthumus will be lost (plus, he's about to be tossed out of court for his effrontery with the princess), he cheats at the game. And it is a game to him; he can't conceive of the dire consequences his false tale will trigger. When, back in Rome, he does witness Posthumus's reaction, Steinfeld's Iachimo clearly considers backing out of his report. But he then not only realizes that he's just won some nice jewelry, he also remembers that Posthumus had promised to kill him if he misrepresented Imogen. Oh well, Steinfeld's manner seems to suggest as he shrugs and turns away, ring and manacle in hand. With their individual, heartfelt performances and solid ensemble delivery of the verse—even when they switch between roles on the strike of a drum in the final scene—Fiasco's Cymbeline is great Shakespeare. The fun they have as they take us with them through this obtuse, mangrove of a play using clear-eyed storytelling verve and one heckuva trunk is exquisite, superb theater. The magic of Fiasco's Cymbeline transcended the stage for us. I was so overwhelmed with the joy of the production I just had to talk to someone about it, so I started up a conversation with a woman sitting also by herself in the front row next to me. We chatted and emailed and now we're married and living in Australia. It was a magical production. I took a photo of our seats as a memento when I returned to the Barrow Theater this year to see Buyer and Seller. Thanks for the great review.